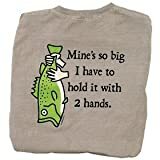 Yes, mine IS so big I have to use two hands! Ha! Another great one from Fishboy. As usual, they take a top quality tee, custom dyed it here in the USA and carefully silkscreen the original Fishboy graphics designed by Paul Ocepek. Makes a great gift for the fisherman or women in your life.